INDIANAPOLIS — Many basketball observers were outspoken in saying they didn’t believe the Indiana Pacers got enough when they traded Paul George to the Oklahoma City Thunder. 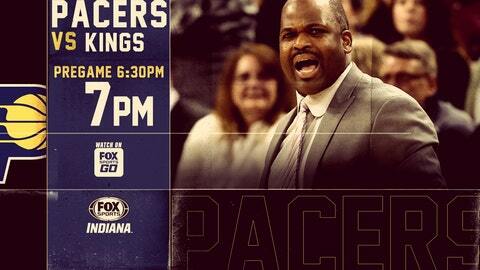 Heading into a Tuesday night game against the Sacramento Kings, however, the Pacers (3-3) certainly are pleased with what Victor Oladipo and Domantas Sabonis — the two players Indiana received in exchange for George — are contributing. Oladipo, who was named the NBA Eastern Conference Player of the Week on Monday after hitting a game-winning 3-pointer in a 97-94 victory over San Antonio on Sunday, has been the Pacers’ leading scorer in each game. Oladipo yelled to the crowd, “This is my city,” after hitting the 30-footer with 10.3 seconds left to put the host Pacers ahead of the Spurs for good. Oladipo, who averaged 28.7 points in the past three games, is producing 25.5 points a game overall this season. Sabonis has been starting in place of center Myles Turner, who will miss his sixth consecutive game Tuesday with a concussion and a sore neck. Sabonis is averaging 13 points and 10.2 rebounds. He set a career high with 22 points on 9-for-9 shooting against the Spurs. “He’s been playing great basketball since he’s been here,” Pacers coach Nate McMillan said of Sabonis. “He’s had to make an adjustment adapting to going from the second group to the first group. He spent most of his time in training camp building chemistry with that second group. He’s starting to get a feel playing with the first group. In the Pacers’ three victories, Sabonis has made all 23 of his shot attempts. Sabonis skipped practice Monday after playing with a head cold Sunday. “The guy never said a word, just went out and played hard and had a near-perfect game,” McMillan said. Sabonis is questionable for Tuesday night. Although McMillan said Turner won’t play Tuesday, it is possible Turner could return at Cleveland on Wednesday night. The Kings rested point guard George Hill, a former Pacer, and power forward Zach Randolph on Sunday in a 110-83 loss to the Washington Wizards to give their young players more of an opportunity to see action. It was the fourth consecutive loss for Sacramento (1-5). “We’ve got to be better at being ready to play at each position because we’re going to have to overcome playing a team that has got a lot of experience and they were ready to play,” Kings coach Dave Joerger told the Sacramento Bee. The Kings fell behind the Wizards 13-0 early and never threatened, trailing by as many as 37 points. It was the first start for rookie De’Aaron Fox, who was held to two points on 1-of-8 shooting. Fox is averaging a team-high 12.7 points. Bogdan Bogdanovic is next at 12.3 points. Sacramento has eight players averaging 9.2 points or more.